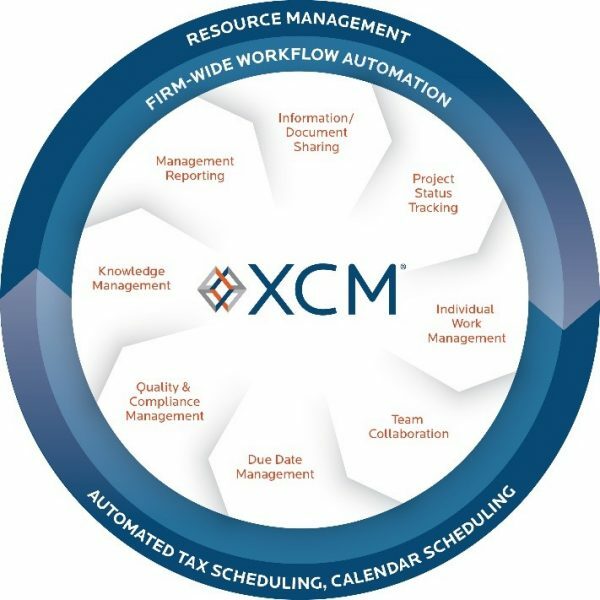 XCM works with organizations to reduce turnaround times on client deliverables, such as tax returns, client accounting services, and audit engagements. As a result, XCM claims it can deliver a 500% return on their investment! XCM can benefit organizations who need to decrease business process timeframes by streamlining work routing to address bottlenecks, improve visibility across projects, and reduce the risk of costly errors. Provides automated tracking and workflow for business processes across all departments, including Tax, Audit, Client Accounting Services, HR, Operations, IT, etc. Allows firms to mirror their actual workflow process within a Web application interface hosted on HTML5. Works horizontally with the firm’s current tax, document management, and practice management software. Allows each employee to have a custom home page, a “My View” page, that acts as a detailed daily “to do” list, and includes the steps required to complete tasks –keeping everyone organized and efficient. Allows easy access to all the task information and related source documents through a digital control sheet that is accessible from the user’s home page. Provides advanced, query-based reporting that users can filter and sort, based on specified criteria in real time. Serves as a strategic management tool for partners and managers. XCM is a powerful application that includes features and benefits not found in many document management solutions currently marketed to the accounting industry. Pricing is by user; contact XCM directly to learn more. Web-based, browser- and device-agnostic application; all client information and reports are accessible remotely on any Internet browser at any time, from anywhere. XCM offers very tight integration with many accountant-centric tools. XCM is an open platform and works with most major tax, accounting, finance, audit, and operations applications. Because it is a Cloud-based solution, there is very little involved with setting up the service and it is browser-agnostic. Therefore, you can continue to work using your browser of choice. Oorganizations in many industries use XCM, including public accounting firms of all sizes. In fact, XCM dozens of the Top 100 public accounting firms in America currently use XCM. Additionally, numerous Fortune 500 companies use XCM to automate workflows in various departments. XCM Solutions was born from an accounting firm that was one of the early pioneers in the development of the paperless office. In 1999, the accounting firm, KAF Financial Group, became one of the first CPA firms in the country to fully adopt the paperless philosophy. It was through that understanding of the mix between technology and the process, that Founder & Chairman Mark Albrecht first conceived XCM as the engine to support the totally paperless workflow solution used in his outsourcing company, Xpitax LLC. In its earlier stages, XCM was developed to handle the workflow for returns that were outsourced, however, Mark and his accounting firm envisioned a much greater use of the technology they developed. They determined that the same technology that allowed their CPA firm clients to outsource returns could be developed and used to support the entire workflow process that takes place internally inside an accounting firm to make it more efficient, more productive, and more profitable. The end result was the development of their two products: Xpitax Outsourcing used to control the offshore workflow process, and XCM to control the in-house workflow process. The XCM team is comprised of former CPAs and industry experts with extensive experience in the accounting industry. The combined knowledge of this group of people provides the company with a clear understanding of the issues facing accounting firms on a daily basis and the foresight to develop technology that can be used to overcome those issues. The common goal is to help clients streamline their internal workflow process using simple and intuitive cloud-based solutions.